KIEV, Ukraine -- Everywhere I went during my recent visit to Ukraine, I ran into people heartbroken about what war with Russian-backed separatists has done to their country. Elena Bilan, 55, prays at a makeshift shrine in Kiev to dozens of people killed by mysterious snipers during last year's Maidan uprising that resulted in the ousting of former president Viktor Yanukovych. "What will happen next year I don't know. I have a son at the front and I help him with everything I have," Bilan said. I encountered tears in Odessa, Mariupol, Donetsk, Amvrosiivka, Vasylkiivka and Kiev, government- and separatist-held towns where the brutality of the conflict and the likelihood it will last seemed to be setting in. Everywhere, the sadness was accompanied by financial fear. Yet the war has caused feelings on both sides to harden against what many here see as Russian – or Ukrainian – aggression. 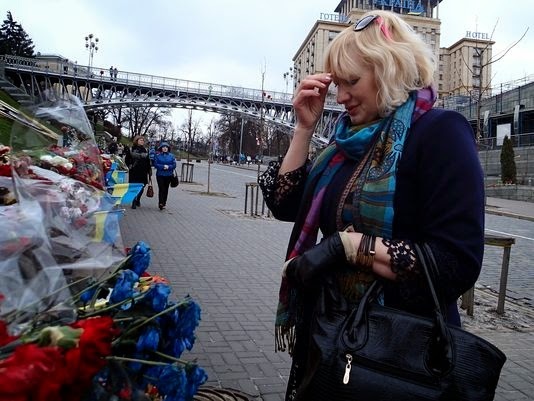 Elena Bilan, 55, prayed at makeshift shrines to dozens of people killed by mysterious snipers in Kiev during last year's Maidan uprising that led to the war. "We used to have a lot of tourists from Belarus and Russia. Last year we had a lot of people from Donetsk, but they weren't tourists, they were displaced people," she said. "What will happen next year I don't know. I have a son at the front, and I help him with everything I have." Prices on foreign goods have risen while wages stagnate. Some jobs have disappeared, and everywhere young men are waiting to find out whether they'll be mobilized for the country's defense. In separatist-held Amvrosiivka, near the Russian border, I spoke to a group of mothers waiting in the cold for handouts from an aid group. Those who had jobs weren't getting paid. Government assistance no longer arrives. And the war is killing their men. They were afraid rebel officials would retaliate against them if they spoke candidly on the record to a reporter. Eventually, Natalia Larkina, 30, Olga Lapteva, 35, Alona Peleshok, 33, Marina Azmanova, 39, and Tatiana Belsmer, 38, agreed to talk as a group. Belsmer, a clerk at a new car showroom before the war, has two small children and a son who could be drafted into the rebel military. She'd like to leave her town and go somewhere else, anywhere else. But she doesn't have the money. She started crying as she contemplated her fate. She admits that she supported separation from Ukraine a year ago. But she never expected war. "Many people were killed," she said. "It's almost impossible to forgive." In Kiev, Oksana Semenets, 25, stood in line with a friend outside the Pinchuk Art Centre, a free art gallery that is one of the few entertainment venues people here can still enjoy. "We can't buy a house and can't afford a child now," Semenets said. "Now, everyone is nervous. We're waiting for the mobilization." Semenets' husband, who plays the trumpet with the National Philharmonic Society of Ukraine, may soon have to trade in his tuxedo for fatigues. Semenets, a pianist and teacher, opposed pro-European demonstrations when they began in the fall of 2013. Ukraine has a long cultural connection to Russia, especially in the musical sphere, and Ukraine is a country with resources that can develop without attaching itself to Europe, she said. But the war and the actions of Russian President Vladimir Putin changed her mind. "I'm not against (Russian) people, I'm against Russian authorities and what they do," she said. "Let them deal with their own huge country and leave us alone." Mykola Polishchuk, 62, a retired store manager who has traveled across the region, said countering Russia and its cronies in eastern Ukraine means going up against a deep Russian nationalism that's hard to reason with. "Their Russian identity is the glue that holds their Russian society together," Polishchuk said. "It's a kind of fascism that believes we don't need good cars, bread or economy as long as we have that (identity) to hold us together." He saw the influence of such thinking on his sister. who moved to Donetsk and then took three years "to change back to normal" after she moved back to Kiev. But he's optimistic that Ukraine, with its natural riches, educated workforce, and industrial capacity, can prevail. All it needs is Western aid, and Polishchuk is sure it's coming. Ukraine needs Western capital as well as agricultural and technical know-how to improve its economy, Polishchuk said. And, he added, "If Putin is to be stopped, we need modern American weapons."